I’ve recently returned from Codfish Island/Whenua Hou where I spent a week helping rangers from DOC’s Kākāpō Recovery team. 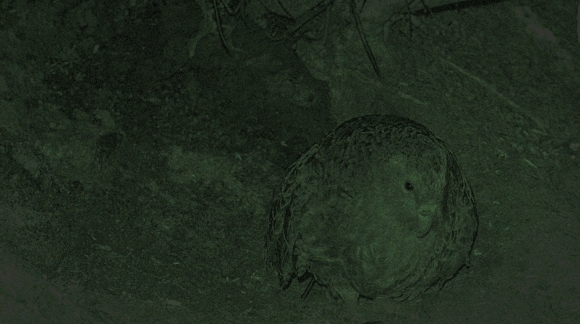 While I was there I was lucky enough to experience the hatching of the first kākāpō chick of the season. 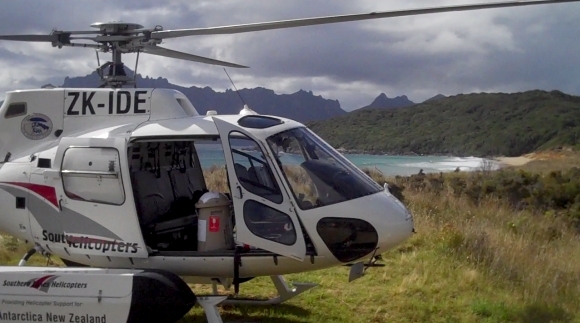 The journey to Codfish Island began with my first ever ride in a helicopter. As the chopper flew over Foveaux Strait I could almost hear the Jurassic Park soundtrack playing in my head. We were heading to the New Zealand equivalent of a ‘land before time’. Upon arriving on the island it truly did feel like I had been transported to another era. Birds, bats, lizards and insects ruled the island, and the small hut just off the main beach at Sealer’s Bay, seemed to be an oddity in such a wild and ancient place. The island is home to most of the surviving population of kākāpō in the world, and was teeming with kākā, kākāriki, korimako, mōhua and the Codfish Island mātātā. The diversity of plants at different points on the island was stunning; I had never before seen such lush plant life and native bush. 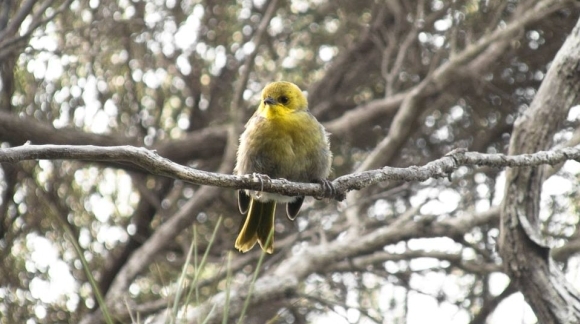 The local korimako/bellbirds were by far the friendliest native inhabitants of these bushes and they were not afraid to land right at your feet and check you out before returning back to the bushes alongside the tracks. The curiosity of the bellbirds was only rivalled by that of a kākā called George who loved getting his beak into anything that was left lying around the hut. He was even blamed for one or two items of clothes that went missing from the washing line. Having grown up in the North Island I had never before seen a mōhua/yellowhead. 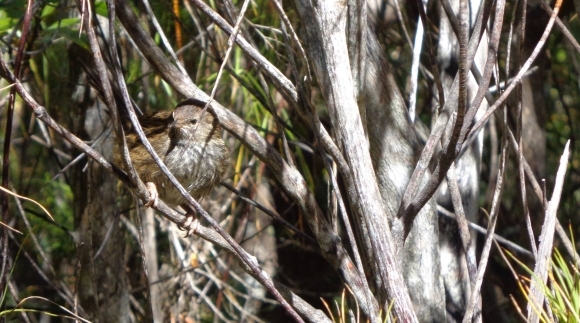 This beautiful little bird was last year crowned New Zealand’s Bird of the Year so I really hoped I would get to see one during my stay. Not only did I get to see one, but I discovered they are social creatures and groups of them could be seen flitting from branch to branch and singing from the treetops. At night the short-tailed bats took over the island. Unlike other bats they use their folded wings as limbs to scramble around on the ground to search for food, if you are walking around the island at night you have to be careful where you step. The booming and chinging of the male kākāpō can be heard all over the island at night. One evening, as we were transporting gear from one of the kākāpō nest sites, we ran into Wolf the kākāpō booming his little heart out just off the track. If you’ve never heard a kākāpō boom before it’s quite an unusual sound. Not only do you hear it but you can also feel the vibrations go right through you. DOC’s ensures the kākāpō are well looked after and protected from pests and diseases. Quarantine on the island is strict. 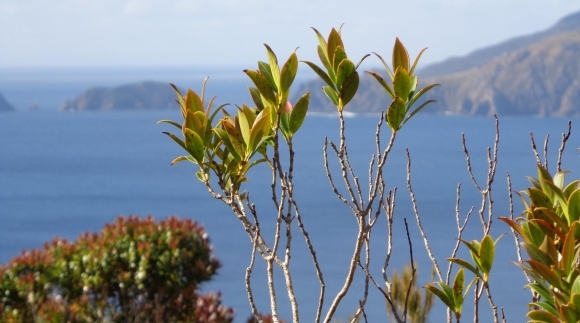 Diseases and pests could do real harm to the remaining kākāpō population and the other species that call Codfish Island home. While on the island one female kākāpō needed to be caught for a health check. Transmitters make finding the kākāpō a reasonably easy job, although catching them isn’t always as simple. Sometimes the kākāpō might be sleeping up in a tree or tucked away on the forest floor. These are wild animals, so they don’t take kindly to human intrusion. 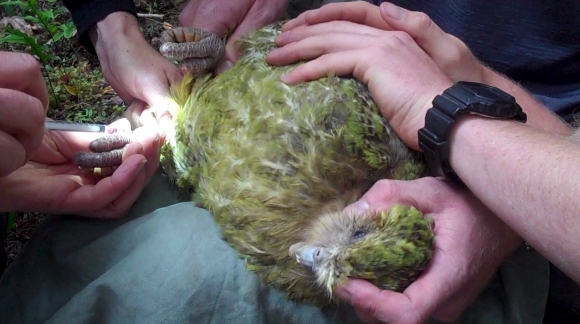 In this case the kākāpō was easily found and caught and the health check turned out to be a quick and painless affair. DOC’s Kākāpō Recovery team doing an amazing job caring for the kākāpō of Codfish Island and I consider myself really lucky to have spent a week there meeting this team who are doing an awesome job for kākāpō conservation.